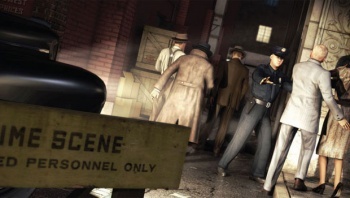 Long delayed film-noir mystery game L.A. Noire is no longer a PlayStation 3 exclusive, and will be coming to the Xbox 360 as well. You can be forgiven for being a little fuzzy on what L.A. Noire is all about, as it's been a while since we've heard anything about it. Announced back in 2006, with a release window of 'between November 2008 and September 2009' - which it missed incidentally - L.A. Noire has been a long time coming, and for the longest time, the game was going to be a PlayStation 3 exclusive. But in the post announcing that L.A. Noire would be the cover story for the upcoming March issue of Game Informer, it was confirmed by Game Informer writer Matt Kato that that was no longer the case: "It's not a PS3-exclusive," he said. "It was at one point, but it's coming out for the PS3 and 360 ... I really hope the game goes deep into a whole seedy, L.A. Confidential/crooked L.A.P.D./Chinatown vibe." L.A. Noire is described as "an open-ended challenge to solve a series of gruesome murders" set in "the classic noir period of the late 1940's", and as a long-time fan of Raymond Chandler and his Phil Marlowe character, I've been looking forward to this game for a while. It's been a long time since there's been a game that really tackled that hard-boiled genre with any real style, and no game has really touched it since Max Payne. As a fan of the genre, I'm glad that more people are going to get a chance to play this. Now; what system to get it for?